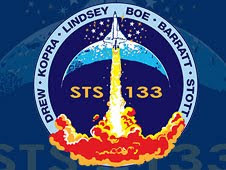 The Halloween card lingered on here while I prepared to post news of the final launch of the Shuttle Discovery, STS 133. The launch was originally scheduled for last Monday, but a series of technical glitches delayed it on a day-by-day basis. Finally, the window of opportunity closed, and the launch is now scheduled for November 30 at the earliest. Meanwhile, e-friend Becka, she of the fabric art genius, has created a beautiful shuttle-related counted thread embroidery piece that you space buffs will covet. Be sure to read her description of what prompted her design (see Reference Links below). Given that I can't hem a dishtowel, I'm in total awe of her talents! Other e-friends, Cactus Jack Splash, Mushboy, and DOR, have submitted their photos to NASA's Fly Your Face in Space program. so they are eagerly awaiting the launch (see Reference Links below). After the launch, they can retrieve a Flight Certificate - a commemorative certificate signed by the Mission Commander. Great disappointment on part of youngest daughter here. She is flying her face in space, too. I guess my kiddos caught the space bug from us. I've done cross stitch for years, but it pales by comparison to oldest daughter, her work is all original designs! She is pretty amazing. Remembering John F. Kennedy, Jr.